On this 3.5-hour car tour, discover Las Vegas-based reality television shows up close and in person. Visit the filming locations of ‘Counting Cars’ and ‘Vegas Rat Rods’ plus stop by Shelby American’s legendary museum showcase and a photo stop at the iconic ‘Welcome to Fabulous Las Vegas’ sign. Enjoy an insider’s narrative from a professional tour guide at each spot and lunch at Vamp'd Rock Bar and Grill. A dinner option is also available on Tuesday Nights. 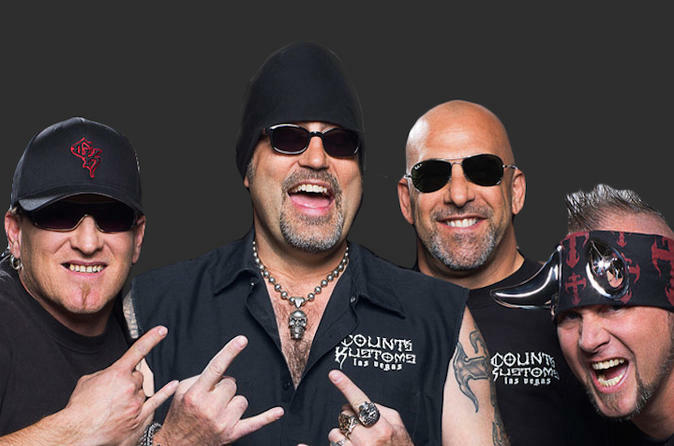 The Count Kustom's Tuesday Night VIP Dinner Tour option includes a visit to Danny Koker's shop, dinner at Vamp'd Rock Bar and Grill and a meet greet with one of the cast members. Transportation from the Rio Hotel is included. Your exciting tour starts at the Rio Hotel and Casino, where Count’s Tattoo Company is located. Have a look around before boarding a mini bus, customized inside and out by Count’s Kustoms (when available). Enjoy a short drive to stops for photos at the Welcome to Las Vegas Sign before heading to Count Kustoms, the chopper and hot rod dealer featured in the History Channel’s hit show Counting Cars. Owned by Danny Koker, one of the recurring guests on Pawn Stars, this is the one-stop shop for paint, upholstery, and frame-up builds for cars. Next it’s on to WelderUp, the customization shop owned by Steve Darnell and his crew and features on the show Vegas Rat Rods. Steve is famous for the exciting cars he works on and the unique treatment he gives to each project. After visiting the TV sets, head over to the Shelby Museum to peak at The Shelby American Collection, an exciting display of Shelby American cars. Wander through interactive exhibits, peruse the gift shop and scan the library as you learn more about these classic cars. Before returning to the Rio Hotel and Casino, you'll stop at Vamp'd Rock Bar and Grill where you'll receive a $15 credit per person to use towards your meal. Only interested in the Count? Choose this option (available on Tuesday night) which includes a visit to Danny's shop, dinner at Vamp'd and a meet and greet with one of the cast members of the show! Your tour will end at the Count's tattoo shop inside the Rio Hotel and Casino and includes transportation by mini-bus customized by the Count's crew.